• Remove the label from the water bottle. • Cover half (vertically – from opening to bottom of bottle) of the water bottle using duct tape or taping on aluminum foil. • Use the thumb tack to poke a hole through the duct tape on the bottle, about two inches from the bottom of the bottle. • Use a pencil or similar object to enlarge the hole. 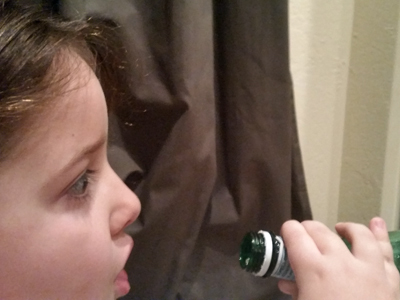 • Fill the bottle with water, keeping your thumb over the hole so the water stays in. 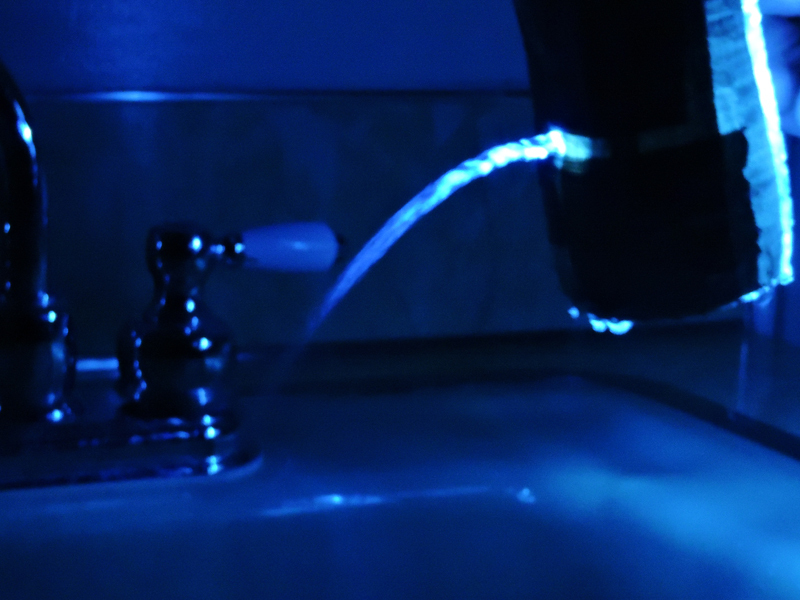 • In a very dark room, hold the water bottle over the sink or basin. 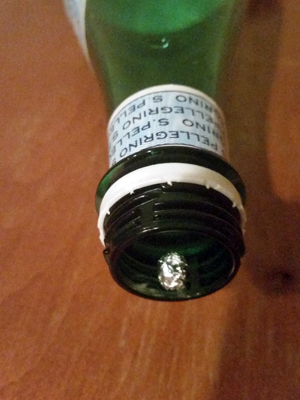 • Shine a flashlight through the uncovered side of the bottle toward the hole where the water is coming out. 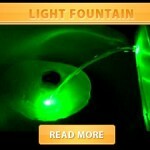 • Watch as the stream of water forms an arc that the light follows down into the sink. N.B. : The light beam travels through the stream of water, even when the stream bends, as it does in this experiment. The light beam bounces off the walls of the water stream and follows it to the end. This is called internal reflection. The light ray inside the stream of water behaves as it would inside an optical fiber. Optical fiber works like this: you send a light beam into one end of the fiber and it comes out the other end, even when it bends, just as light travels through the stream of water in your experiment. Some bath products fizz and make bubbles when added to water. Ever wonder why? Try this experiment to find out. • Put the gloves on and combine the baking soda, citric acid, corn starch, and Epsom salts together in a bowl. • Mix well and set aside. • Combine the oils, water, and borax in a jar. • Cover it with the lid and shake vigorously to mix the ingredients well. • Slowly add the liquid mixture to the dry mixture, a few drops at at time, stirring continuously and quickly to minimize fizzing. When fully mixed, the mixture will be very dry and crumbly. • Pack the mixture into molds or ice cube trays and let rest for two days. 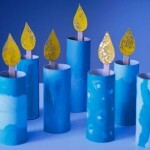 • After two days, carefully remove the mixture from the molds. N.B. : A bath bomb is really showing how acids and bases react when mixed together. 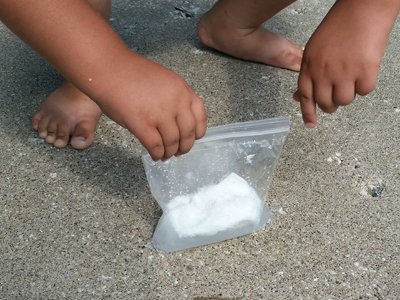 In this experiment, the baking soda is the base and the citric acid is, well, the acid. 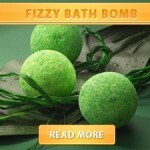 But the reaction of this acid-base combination can be controlled by the other ingredients in the bath bomb. The cornstarch and Epsom salts both act as liquid absorbers to help keep the baking soda and citric acid from reacting with each other when liquids are added. They are also helpful if you live in a place with high humidity. The borax acts as both a preservative and an emulsifier, stabilizing the acid and the base and keeping them from reacting with each other before entering the water. Water is the catalyst for the reaction to occur because it dissolves the solids and allows the ions in the acid and the base to move and collide with each other, causing a chemical reaction to occur. A catalyst is something added to a chemical mixture that speeds up the chemical reaction time. This reaction forms carbon dioxide, a gas, which rises to the surface of the bathwater in the form of bubbles. 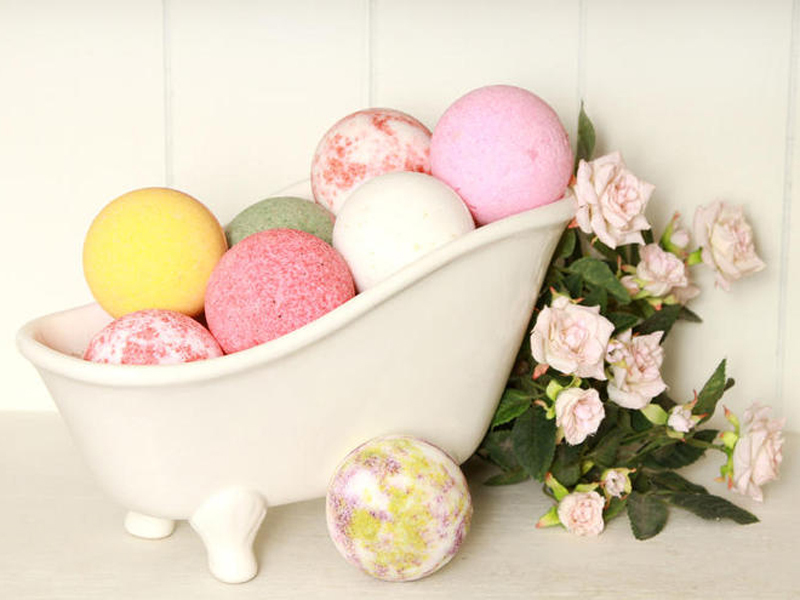 The oils and the fragrances are useful as a liquid to help form the bath bombs as well as leave the skin smooth and scented. • Hold the egg over a bowl and use a thumbtack to pierce a small hole in the pointed end and a larger hole in the other end of the egg. • Hold the egg very gently to make sure you don’t crack it! • Use a skewer or unfolded paperclip to carefully break up the yolk inside of the egg. • Hold a drinking straw over the smaller hole and blow through the opposite end of the straw. • Run a little water inside the egg and shake it out. • Use the straw again to blow out any remaining water. • Place the egg shell in a glass and add enough vinegar to cover the egg. • Using your fingers or a pair of tongs, gently hold the egg under the liquid until the air escapes and most of the egg shell stays below the surface (this may take several minutes). • Leave the egg in the vinegar for several hours until the shell begins to break down. • When the shell has started to break away, you will see a flexible egg shaped layer inside—this is the egg membrane. • Once the egg shell has completely dissolved, remove the membrane from the glass of vinegar. • Rinse the membrane in water and gently squeeze it to remove the water from inside. • Pat it dry with a paper towel. • Continue tossing until the whole thing has inflated like a balloon. • Once it has inflated, sprinkle a little baby powder all over the outside. • Try to get some powder inside as well as it will prevent the sides from sticking together and help the egg inflate more easily next time. • Set the powder-coated inflated egg on the palm of your hand and press the air out with your fingers. • Fold the egg in half several times and pinch it slightly so it stays folded, then toss it between your hands again and watch it reinflate! 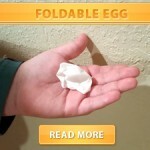 This process of folding and tossing can be repeated several times until the egg membrane dries out and won’t inflate. • Attach a piece of sting to each apple. • Have each hand hold one string so that the apples are at nose-level, 6″ apart. • Blow hard between the apples and watch them move! • The apples will get closer to each other. 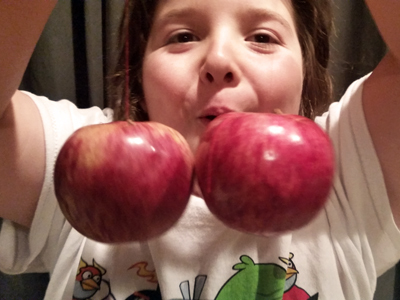 • The air pressure is lowered as you blow between the apples (think of the air molecules as ping pong balls … they balls don’t have enough time to touch the apple surface as they zoom by). 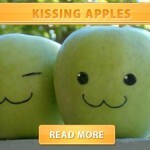 • The air surrounding the apples that’s not really moving is now at a higher pressure, and pushes the apples together. • Roll up a pea size ball out of foil. • Place the bottle on the edge of a table. • Put the ball of foil inside of the bottle neck. • Try to blow the ball into the bottle. • The foil ball shoots back out towards you. 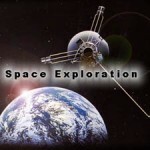 •The same principles that keep airplanes in the sky also apply to this experiment. The key point is that moving air is at a lower pressure than still air. This is the Bernoulli Principle. In the case of the bottle the air that is blown towards the mouth is deflected around the the sides of the bottle (very little moves past the ball of foil). This means that the air pressure in front of the ball is lower than behind, and so the ball flies out. Airplane wings are specially shaped so that air travels faster over the top of the wing than over the bottom surface. 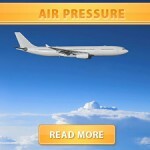 Again the pressure is lower above than below and the wing is “pushed” upward by the higher pressure air – called lift. The faster the plane moves forward the bigger the lift it experiences. 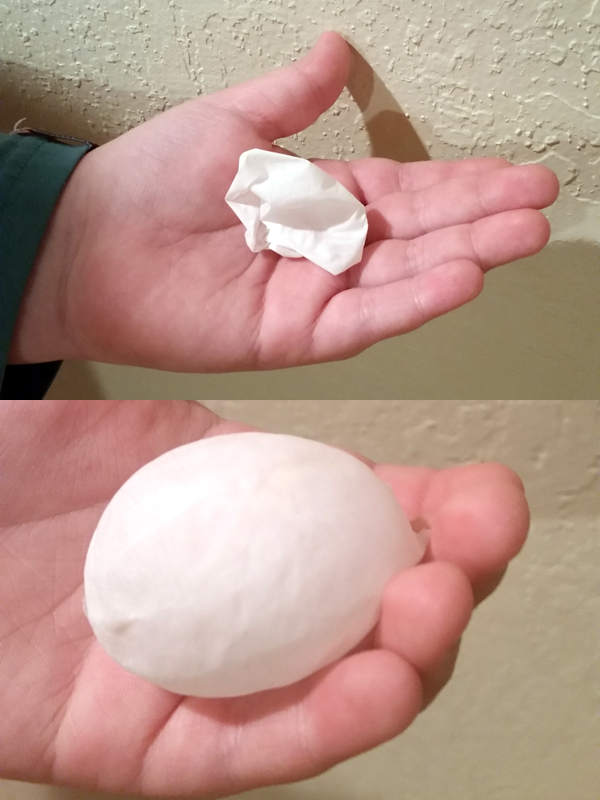 • Tear your paper towel into a 5×5 inch square. • Place baking soda into the middle of the square. • Fold the sides of the square into the middle to create a packet. • Pour 1/2 cup of vinegar and a 1/4 cup of warm water in the sandwich plastic bag. • Begin zipping the bag closed. • When it is half closed drop your time release baking soda packet in and quickly close the rest of the bag. • Shake the bag a little and then place it on the ground. 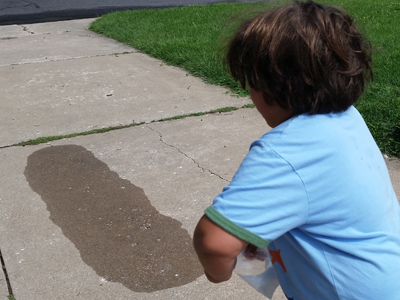 • Watch as it begins to fill with air as the baking soda and vinegar react. 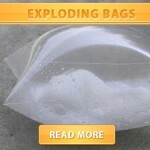 The bag will fill with air until it bursts with a grand POP!